Malaysia has had a strong and rich history of inter-racial harmony and multi-culturalism since its very inception. But we must admit that it is still very complex with jobs and economic sectors identified with race, income inequality between the races and different educational systems existing. Governors of Bank Negara, Aziz Taha, Jaffar Hussein and Zeti Aziz. 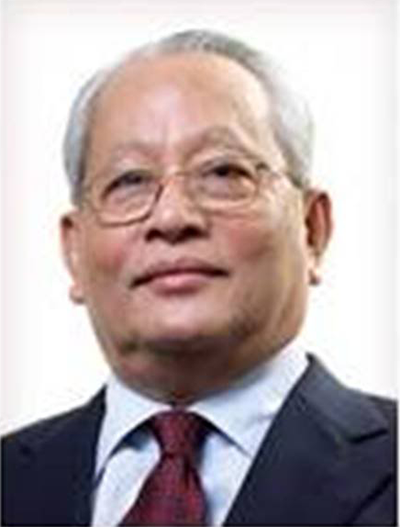 Professor Ungku Aziz, Zeti’s father, is a renowned economist. Zeti’s grandfather, Syed Mohammed Alsagoff, used to own Pulau Kukup, and had a concession to print his own money. Today, we use money signed by his granddaughter. Since the last general election, the political narrative in Malaysia has centred around issues concerning race and religion, particularly the position of the Malays and Islam. 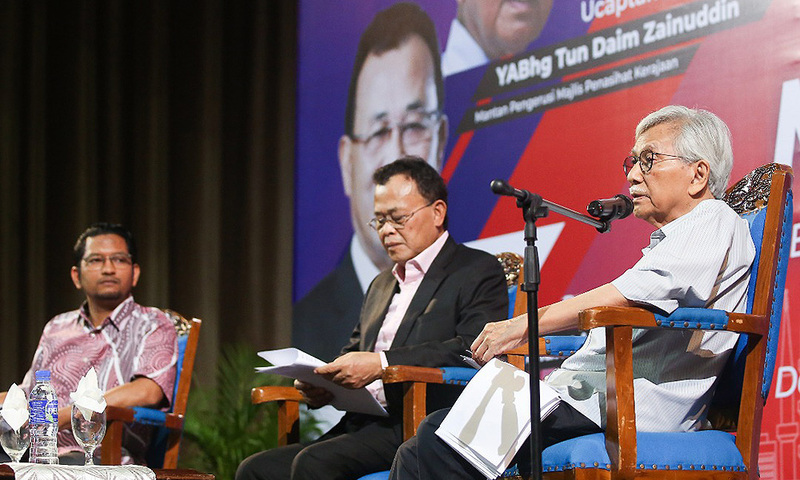 Speaking at UTM Skudai in Johor last night, former finance minister Daim Zainuddin addressed this issue and described the claim that Malays are under threat as nothing more than nonsensical political rhetoric. “Despite being more educated and having a large educated segment, we are still unable to convince ourselves that Malays have nothing to fear in this country. “Are Malays thinking strategically, critically and logically? It looks increasingly obvious every day that the Malays are thinking with their emotions instead of with their intellect. We must ask ourselves – what is happening to us?” he said. 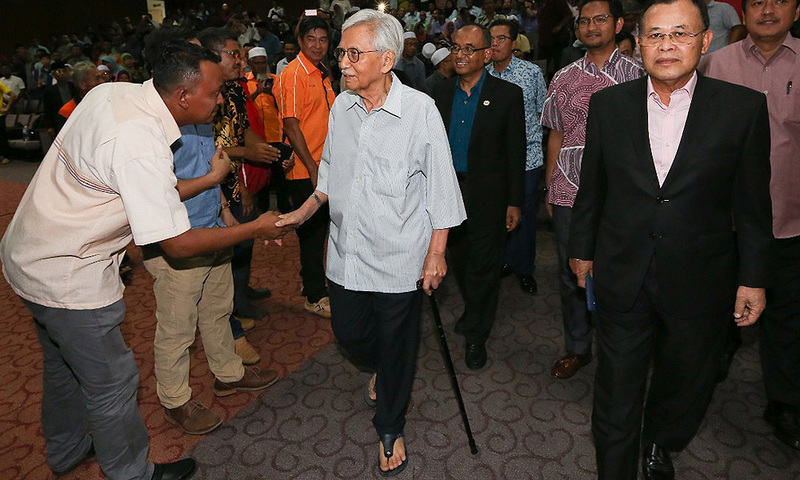 According to Daim, who headed the Council of Eminent Persons, the Malays have allowed their emotions to run wild and influence their perception of others. “When Mastika (Malay-language magazine) stopped writing ghost stories, circulation ended and now there is no more Mastika. Now instead of reading about ghosts in Mastika, we are seeing ghosts around every corner. “Instead of depending on logic and facts, we prefer to buy into the racist rhetoric of politicians with dubious reputations,” he added. 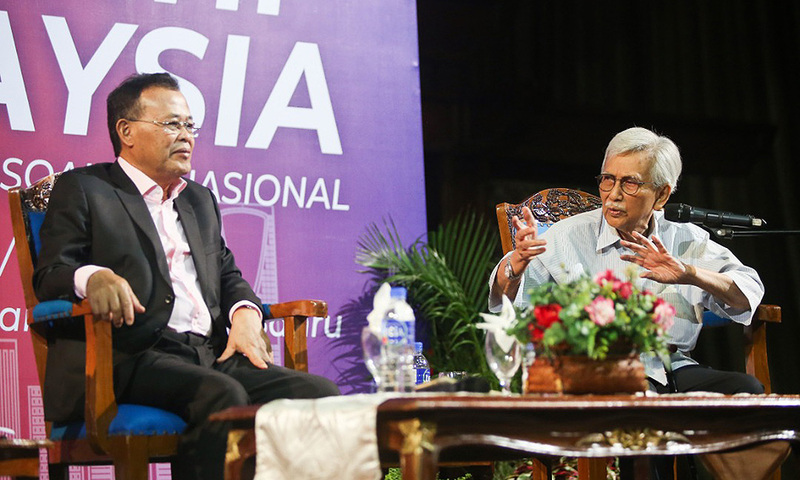 Daim then asked his audience, comprising mainly of academicians, what role they were playing in injecting logic and facts into the Malaysia narrative. “Do you intend to go along with the emotional flow or do you see it as your academic duty to question the irrational narratives that are being shoved down the Malays’ throats? “Do you as ‘the educated’ speak honestly and bravely about what is happening or do you simply pretend that this growing racism is justified? “All of you here are highly educated, but how many of you have bought into the nonsensical political rhetoric that the Malays are being threatened by the non-Malays in this country? That Islam is under threat simply because of one or two people being insensitive enough to post something on the Prophet (Muhammad)?” he added. Daim said the current narrative, which centres around race and religion, gives the impression the Malays are on the verge of being driven out of their own country. “There is so much anger and indignation when non-Malays were appointed to high posts in the government as if this is something new. “Why is there not the same anger when we are confronted with facts of corruption and kleptocracy of the highest order among our Malay leaders? We don’t feel offended when it was prime news all over the world. Instead, we respond with “Malu apa? (Ashamed of what?)”. Kalau “tak malu,” apa jadi kepada iman kita (If we are not ashamed, what has happened to our faith)? “The Malays can continue down this emotional and irrational path at our own peril or we can stop, think, reflect and call for change. “Nobody is forcing us to be emotional and irrational. We have chosen to be that way ourselves because we have allowed ourselves to be bought over by politicians whose only goal is to gain or regain power, no matter what the cost – and the cost is almost always ours to bear,” he added. To understand our current political climate, it is important to look back at our history. Kusut di hujung, balik ke pangkal (Messy at the end, return to the root of the problem). The history of the Malays starts from long before the formation of Tanah Melayu. We are descendants of great empires, from Langkasuka, to Srivijaya, to Majapahit, to Melaka. Melaka, of course, is our most popular tale, that of a world-famous port whose global success led to its eventual colonisation. And when Melaka fell to the Portuguese, those descendants of Sultan Melaka who survived founded a new empire here in Johor. They took control of the southern Malay Peninsula, spreading across Riau, Anambas, Natuna, Tambelan, Borneo, and Sumatra. Their success was attributed to the wisdom of their rulers, and their openness to international trade. In more recent history, the formation of the Malayan Union and the subsequent opposition led by UMNO were significant events that triggered real change in the political organisation of the Malays. Onn Jaafar, himself from Bukit Gambir and an MB of Johor, founded UMNO in 1946, signalling the height of Malay political supremacy. We were united and we were strong. But our unity did not last. We didn’t know how to deal with success; the Malays started to split. When we are successful, we are drunk with success. When we fail, we look for scapegoats and go amok. Our battle with the Malayan Union was, in a way, the first true independence that we achieved – when the British backed down. We became masters of our own land. But the political landscape changed, and many non-Malays began to consider Malaya home and demanded a say in their new homeland. In 1951, Onn made the first attempt to unify the races in a single party when he tried to open the membership of UMNO to non-Malays. However, Umno members at the time rejected it, and he left the party. Nevertheless, the 1952 elections marked the first real political collaboration between Malays and non-Malays when UMNO and MCA joined forces for political victory. They were later joined by MIC to form the Alliance, signalling political unity amongst all Malayans, achieving a sweeping victory in the 1955 elections. Then came the negotiations for Merdeka, where all Malaysians worked hand-in-hand to shrug off the yoke of colonialism. We learned that we were stronger together – when all Malaysians were united, we could overcome challenges. All this happened against a backdrop of consistent armed warfare against terrorists during the Emergency, when all races fought shoulder to shoulder to gain victory. We are the only country in the world to defeat terrorists. Then came the formation of Malaysia and Konfrontasi and throughout Malays were working with non-Malays to achieve national goals. So, Malaysia has had a strong and rich history of inter-racial harmony and multi-culturalism since its very inception. But we must admit that it is still very complex with jobs and economic sectors identified with race, income inequality between the races and different educational systems existing. It cannot be denied that Malaysia will prosper when Malays prosper. You cannot have 50 percent of your population in low income, there will be economic instability affecting everyone, regardless of race or economic status. For Malaysia to succeed, the Malays must succeed. But this can only be achieved within the national context, working together with non-Malays for the benefit of Malaysia. Why is it that Malays were able to work so closely with non-Malays for so many years leading up to Merdeka and beyond? Even in the face of outside aggression, there were hardly questions of who deserved Malaysia more – the Malays or non-Malays. Indeed, it was only when politicians decided to use race and religion as tools to gain power that we fell by the wayside. This talk is entitled ‘Naratif Malaysia: Melayu dalam Persoalan National’. My question to you is: should we not just be talking about a National Narrative? Need we break down a national narrative along racial and religious lines? But if your intention is to find answers to inequality, and to answer why the Malays are behind economically, then I really hope that this seminar will provide the answer. When we talk about the Malays, we must talk about Islam. The Malays and Islam are indeed deeply entwined. They cannot be discussed separately. But what this has led to is the ignoring of our cultural and regional heritage, which has been abandoned in favour of foreign cultures (Arabisation especially) which feed into the insecurity of the Malays. It seems that everyone who does not speak like us and everything that we do not agree with, is a threat to Malays and Islam. We must ask ourselves – is this true? Why is this so? Since when have the Malays and Muslims become so insecure about our place in this country? When the Malays were far less economically advanced and far less educated, we defeated the British by rejecting the Malayan Union. We were brave. We knew to organise collectively and strategically. We used our brains to defeat a colonial power. We managed to gain independence without bloodshed. We had no problems working with non-Malays and even learning from other races. As the Malays progressed, it seems so did our sense of insecurity. Why is this so? Could it be that when there were no crutches, we had dignity, and the Malays felt more secure of our place within the country? We are not lacking in Malay heroes. Johor alone has a rich history of formidable warriors, renowned artists, poets, athletes, scientists, doctors, academicians, and businessmen. There was Muhamad Salleh bin Perang, who was the Bentara Luar. He was the first to draw up an accurate map of Johor, without the modern technology that present-day surveyors have available. He was the Head of Land Management and State Survey, and he used his map to plan the development of Johor. He was a Malay, but he was fluent in Chinese and was knowledgeable about Chinese culture, which allowed him to work closely with them in developing the economy. In the realm of politics alone, the list of honours is never ending. Tun Hussein Onn, our “Bapa Perpaduan”UMNO was from Johor. And so was his own “Bapa”, the founder of UMNO, Onn Jaafar. His father before him, Jaafar Muhammad, was the first and longest serving MB of Johor. Deputy Prime Ministers Tun Dr Ismail and Musa Hitam were sons of Johor. Tun Ismail’s family was illustrious on its own, including his father-in-law Seth Said, Deputy MB of Johor, who was part of the delegation for Merdeka, and signed the Merdeka agreement against the Sultan’s orders. Without him, we would not have had Merdeka. Johor produced the President of the Senate, Rahman Yasin. He was Tun Dr Ismail’s father. Tun Dr Ismail’s brother-in-law Ghazali Seth, was Chief of Defence, and he married Sri Norziah – sister of Hussein Onn, daughter of Onn Jaafar. Tun Dr Ismail went to school in Sekolah Melayu Bukit Zaharah in JB with two other famous figures – his brother, Sulaiman Abdul Rahman, and Ahmad Perang, who became the first Malay chairman of KTM. Mohamed Noah Omar, the first Speaker of Dewan Rakyat, was also from Johor. His family too was very special – his two daughters married the men who would go on to be our prime ministers. Rahah, the wife of Tun Razak, and Suhaila, the wife of Hussein Onn. Tun Razak studied at Raffles College, with another son of Johor, Taib Andak, after whom Felda Taib Andak in Kulai is named. His brother Rahman Andak, was one of the early campaigners for Johor’s independence, and was State Secretary of Johor in 1984. Why should we feel insecure with a legacy as illustrious as this? Again, could it be that after being given all sorts of crutches, the effect has been to make the Malays weak and insecure, and most noticeably, lacking in resilience? What has led to this lack of confidence? It seems that when the Malays were facing real challenges, such as fighting for independence, our resilience was so much stronger. As ease and comfort and quality of life improved, confidence and resilience abated. These observations call for sincere self-reflection – instead of picking fights with perceived enemies, we should look inwards and try to better ourselves instead of blaming all of our ills on others. We seem to be scared of our own shadows. Today, there is one Malay graduate for every 20 Malays. Despite being more educated and having a large educated segment, we are still unable to convince ourselves that Malays have nothing to fear in this country. Are Malays thinking strategically, critically and logically? It looks increasingly obvious every day that the Malays are thinking with their emotions instead of with their intellect. We must ask ourselves – what is happening to us? We have allowed our emotions to run wild and influence the way we see others. We watch ghost movies at the box offices. When Mastika stopped writing ghost stories, circulation ended and now there is no more Mastika. Now instead of reading about ghosts in Mastika, we are seeing ghosts around every corner. Instead of depending on logic and facts, we prefer to buy into the racist rhetoric of politicians with dubious reputations. Since I am talking to academicians, I would like to pose this question to you: what role should you be playing in injecting some logic and fact into the Malaysia narrative? Do you intend to go along with the emotional flow or do you see it as your academic duty to question the irrational narratives that are being shoved down the Malays’ throats? Do you as “the educated” speak honestly and bravely about what is happening or do you simply pretend that this growing racism is justified? All of you here are highly educated, but how many of you have bought into the nonsensical political rhetoric that the Malays are being threatened by the non- Malays in this country? That Islam is under threat simply because of one or two people being insensitive enough to post something on the Prophet? The religion cannot be insulted. Only people can be. If our faith is strong, we do not get insulted. In fact, we laugh at such ignorance. And our behaviour should reflect the best of our religion so that we and our religion earn the respect of others. Our country is multi-cultural and multi-religious. We have managed to live here in peace. We are sensitive to our neighbours and respect one another. This is our way. It is wrong to insult anybody, more so the Prophet. To make fun of religion is stupid. But we have laws, and we should respect due process. Many have forgotten our Rukun Negara. The most important document is the Constitution. No Malaysian should make insensitive comments towards other religions and races. But what has happened with the proclamation of Jihad against non- Muslims recently? If Muslims want to perform Jihad, it should be Jihad to better ourselves not only spiritually, but economically, academically and to contribute to the continued growth of our own country. We talk about the Malay narrative as if we are on the verge of being driven out of our own country. There is so much anger and indignation when non- Malays were appointed to high posts in the government, as if this is something new. Why is there not the same anger when we are confronted with facts of corruption and kleptocracy of the highest order among our Malay leaders? We don’t feel offended when it was prime news all over the world. Instead, we respond with “Malu apa?”. Kalau “tak malu”, apa jadi kepada iman kita (If we are not ashamed, what has happened to our faith)? The Malays can continue down this emotional and irrational path at our own peril or we can stop, think, reflect and call for change. Nobody is forcing us to be emotional and irrational. We have chosen to be that way ourselves because we have allowed ourselves to be bought over by politicians whose only goal is to gain or regain power, no matter what the cost – and the cost is almost always ours to bear. So, the choice is up to us – nak duduk macam katak di bawah tempurung (want to be like a frog beneath a coconut-shell)? Do we change and become a force to be reckoned within the context of the national agenda, Malaysia Baru, or do we go down the path we are currently treading and proclaim a narrative that is narrow, focused only on ourselves? Or will we pursue a truly National or Malaysia Narrative, in which we participate and play a very active role? The National Agenda is not a Malay agenda or a non-Malay agenda. It is a Malaysian Agenda that takes into consideration all Malaysians. That fights poverty and inequality without discrimination, respecting the Constitution. I am glad to note that this seminar is directed at the four sectors of politics, economy, budaya and agama. Let us get all of these right. To get all of these right, our education system must change. Don’t treat education as a political football. The education system must be right. Our future, Malaysia’s future, will depend on giving our children the right type of education that will allow them to be confident to face the best in the world. Get education right, then politics and economy will be right. Brains minus emotions will determine our future and the future of Malaysia. Expose our children to the world, then they will want to excel, and they will protect the best of our budaya. There is nothing wrong with Islam. It is not under threat. It is the fastest growing religion in the world. I would like to advise you not to follow politicians blindly. As I said earlier, for Malaysia to succeed, the Malays must succeed. I keep repeating, Iqra’ (Aik Krok) – read to acquire knowledge and to think critically. Choose the right path that will lead to success. Time is very important and we are excellent at wasting time. We will lose to time. Let us tell ourselves from now on we shall not repeat past mistakes. We will give the best education to our children so that they can compete and succeed. Let us leave all failure of confidence behind, and start our future now. Leave this hall confident and ok with ourselves. Tell our children that we will compete and we will succeed. This entry was posted in Daim Zainuddin, ketuanan melayu, Leadership, Malaysia, Malaysiakini, New Economic Policy, Pakatan Harapan, Parti Pribumi Bersatu Malaysia, Politics, The Malays, Tun Dr. Mahathir Mohamad, UMNO. Bookmark the permalink. So long Mahathirism is in play, Malaysia’s is in dire straits. Mahathir is greed personified and that’s Mahathir’s focus is the Almighty $$$$ and nothing else. Greediest Prime Minister Mahathir is in full flight for his last hoorah before kicking the bucket. Mahathir vengeance against YAB Najib is due to not getting any cuts of the many mega projects that was launched since 2009. The cancellation of the crooked bridge was another mega project where Mahathir’s interest was slashed. Since GE14, Mahathir focused only on mega projects where he can get big payouts directly or via his proxies and cronies. Shameless Kutty Mahathir that makes You cringe at his name. Like an insatiable nymphomaniac with unrequited orgasmic outcome. Totally selfish as Mahathir only looks after Mahathir and Malaysia can go to HELL is his attitude. Shame on Anwar (and Mahathir, Azmin or anyone eyeing the PM job) for allowing a Daim to actually make THE MOST IMPORTANT SPEECH ON THE MOST IMPORTANT ISSUE by the PH govt. This speech should have been done by Anwar or Mahathir, the two person (dead or alive) who is most responsible for the state of religo-politics in this country. For decades UMNO/BN excused themselves to the world that they had to compete with PAS on political Islam but turned around and in fact pioneered much of the narratives and myth of religo-politics in this country..
Daim who was never known to be involved in the religo politics in the past, now stands out to clearly state what really is the No1 issue of reform and change in this country. UMNO-PAS politics is based on a slander and lies. Religo-politics is political capital of the bankrupt. UMNO-PAS struggle is not religion nor afterlife, its worldly ambition of those that do not have enough to offer in this life. Spot on! It was Mahathir who co-opted the firebrand from ABIM into his administration to out-Islam PAS. The rest is history and so is multi-racial multi-religious Malaysia. For a new Malaysia to emerge, all Harapan Ministers must tell the Malays and the world at large that all West Malaysians are PENDATANG – WHICH THEY ALL ARE. Till then, a new Malaysia will be still born. I wept with joy. Good for you, Melayu! Be strong and have courage. Hear out what Tun Daim has to offer when he spoke truth in love. The Police Military Government and almost all authority bodies are control by Malays….the Malaý scholars now stands at 1:5 ….meaning the Malays should be very intellectually smart in their assessment but emotionally they r so fragile….. It is the system , stupid ! repeated, over a million time. excuses and justifications for non-delivery of the all the past promised narratives . Greed and insatiable greed for wealth and power. Hypocrisy and pretence, altogether to make Malaysia great again ? Where is the beef ? … the Rule of Law,…. ? ……of the Will and Courage to even change the political leaders mindset of the political leaders ,themselves exmeplarily first, before they can educate and change the mindset of the kampong an the urban Melayu folks ? After 38 years of Mahathirs rule , little or nothing have changed but putting more blames on others ,especially the nonsense, except themselves, whose present and past leaders are actually the same from the previous Umnob government / parties —the “old wine , new bottle”. …..And were all done in name and cover of race and religion. Consequently, MORE Money politics, Abuse of power, Corruption ,Cronyism and Patronage. .. Less Accountability, Competency, Transparency …and LESS QUALITY Education System and Standard, ….LESS QUALITY younger leaders to take over. Trust and Confidence have to be Learn and Earned. Time is not on our side , Action is ! Dear Tun Daim, (who of late appears to be no longer diam), my take is that it is too little too late. Every armchair psychologist will tell you, for free, that no one could wipe away 50 years of mass brainwashing with just a jingoistic soundbite spoken in front of some academics many of whom, I bet, were the most illustrious product of this “nonsensical political rhetoric” So Tun why rant at them? After the seminar is over all of them would just retire back at their airconditioned academic cloisters and perhaps wondered what right has this retired politician got to publicly lecture them?